The Cottonwood Creek Ranch training facility has a a total of 50 stalls, indoor wash racks, three tack rooms and a covered 95′ x 225′ outdoor arena with a track around the outside. The property also has 20 individual paddocks approximately 50x100′ with loafing sheds. A full veterinary lab with breeding stocks allow us to manage our breeding on the farm. We also enjoy 24 hour security and video surveillance on our gated property for the safety of our horses and equipment. We love our new location in Oklahoma City, just a few minutes from the Oklahoma State Fairgrounds where our horses and clients have won countless World and Grand National Championships! Kelly Kraegel has built a thriving business through hard work and groundbreaking accomplishments in the horse industry. In 2016, she became the first professional to train both the ASB Open Western Pleasure World Grand Champion and the Morgan Open Western Pleasure World Champion in the same year. She is also a USEF “r” Morgan judge and is working toward advancing to her “R” status. Kelly’s positive training methods and dedication have taken herself and her customers to over 100 World and Grand National and Reserve Championships. She has given clinics all over the United States and Canada, and was voted the 2011, 2013 and 2014 Horse World’s People’s Choice Instructor of the Year, as well as voted the 2013 AMHA Promoter of the Year. She has been featured in articles for The Morgan Horse Magazine, The International Morgan Connection and Horse World Magazine. On a local level, Cottonwood Creek Ranch was voted 2015 & 2016 Best of Guthrie Awards for Ranches. She loves her job, her customers and her horses and her bubbly personality and attention to detail creates a successful environment. One of her proudest accomplishments was serving as the coach for the 2015 Young Riders World Cup team in South Africa. Her dedication took the team to the top of EVERY gold medal offered—3-Gaited Team, 3-Gaited Individual, 5-Gaited Team and 5-Gaited Individual. Horsemen and is frequently featured in television commercials for local businesses with her beautiful horses (visit our CCR In The Media page). Kelly now has her Commercial Driver’s License to drive her Peterbilt tractor and 15 horse Streamliner trailer, and even has a concealed carry handgun license. Besides her love for horses, Kelly has a pilot’s license and has logged over 110 hours. To add to her list of accomplishments, Kelly is Scuba certified and she is proud to have enjoyed diving the three largest reefs in the world. In January of 2009, Kelly’s daughter Emmy was born. Now most of her time away from the barn is spent enjoying her daughter. Springmill Superstition GCH, Indian Creek Cachet, Indian Creek Highlander, Indian Creek Belle Haven, Trebles High End Piece, Springmill Love Shaq, FCM No Boundaries, Indian Creek Mastermind, Indian Creek Recordbreaker, Indian Creek Triple Play, and countless others. He is also the only Morgan trainer to have won all four World Champion Two Year Old Park Harness and Pleasure Driving in the same year—Open and Futurity—and he’s done this twice. The first time in 2008 and most recently in 2015, when he also won back to back victories in World Champion Three Year Old Park Saddle and World Champion Futurity Three Year Old Park Saddle. 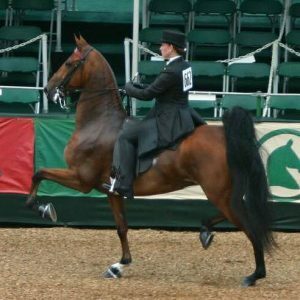 He has also had success with American Saddlebreds, including The Regalist and CH Stonecutter, as well as with the many-time champion harness pony Cherry Royal. His current pint-size star is the many-time champion road pony Regal’s Double Trouble LF, who has won the AHHS Youth Medallion Road Pony Under Saddle probably more times than any other pony, piloted to this honor by his owner Kinslie Dougherty at the AHHS Youth Medallion Finals, UPHA Chapter 5, Oklahoma Centennial, Central States Benefit, All American Classic and many other venues. While Kurt is thoroughly capable to lead an in hand horse or present under saddle, he is probably most admired for his outstanding harness horses, whose brilliant performances are picture perfect and frequently find him at the top of his class. Kurt joined the Cottonwood Creek team in the fall of 2015 and has been an integral member since he first donned his cowboy boots and hung his hat at our door. Melissa began riding and showing Saddle Seat on American Saddlebreds at the tender age of five years old. She competed very heavily and was able to travel all over the country, competing in such prestigious venues as the World’s Grand Championship Horse Show at the Kentucky State Fair in Louisville multiple times, under the instruction of Marsha and Gary Garone of Fairfield South. She graduated from the University of Massachusetts in 2015 with a degree in Equine Management. In May 2015, she moved from Massachusetts to Oklahoma and started as an assistant trainer at Cottonwood Creek Ranch. Currently, Melissa is working on building the lesson program and bringing more people into our wonderful Morgan and Saddlebred breeds. Elizabeth began riding and showing American Saddlebreds at the age of four. When she wasn’t in the show ring, she was likely to be found riding around the countryside at her family’s horse farm, or cruising her Houston neighborhood atop one of two Shetland ponies that lived in the backyard. She worked alongside her sister and brother-in-law at Cameo Farm in Texas, serving as an assistant trainer, groom, riding instructor and whatever else any given day required. In her life away from horses, she spent almost 25 years in the magazine industry, most recently as the publisher of an award-winning magazine in Oklahoma. With her four children now (mostly) grown, she decided that it was time to get back to the barn—the place that has always felt like home. We are very lucky to have her here at CCR!